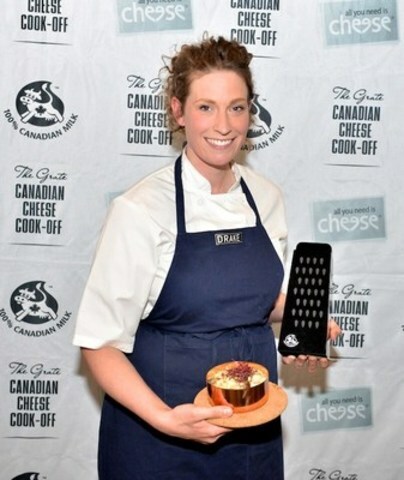 TORONTO, April 8, 2016 /CNW/ - Alexandra Feswick, Chef de Cuisine at the Drake Hotel in Toronto, today emerged victorious in one of Canada's highest profile culinary comfort food battles, Dairy Farmers of Canada's (DFC) Grate Canadian Cheese Cook-Off. With Mac & Cheese again as its theme, the biannual showdown took place at DFC's Canadian Cheese Counter at the Toronto Food & Drink Market. 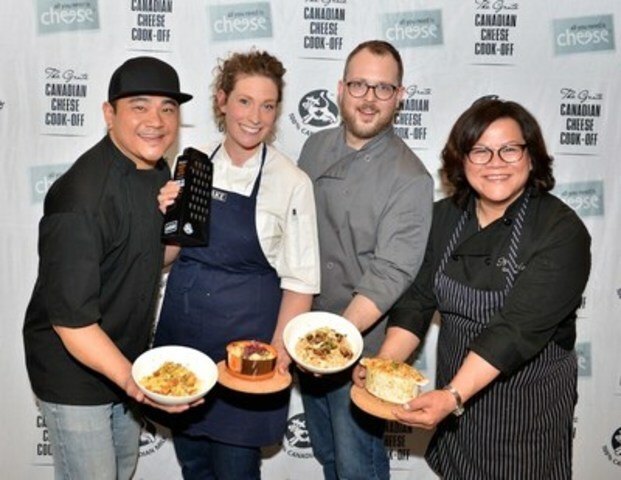 This year, four top chefs and foodies from across Canada took to the stage in an attempt to create the ultimate comfort food using Canadian cheese, pasta and a little imagination. Chef Feswick's truly unique Canadian macaroni & cheese experience starts with combining the distinctive nostalgia of home-styled comfort classics such as Cheddar, sage and mushrooms, and memorably finishes by pairing them with the luxurious flavours of hazelnuts, Blue cheese and Jerusalem artichokes. "The competition was stiff, each chef brought something different and unique to the table. Mac & Cheese is such a comforting dish and I wanted to stay true to that ideal while elevating it with new exciting ingredients like we do at The Drake", says Chef Feswick. This year's four fierce competitors included Andrew Farrell, Chef de Cuisine at 2 Doors Down Food + Wine in Halifax, Nova Scotia; Alexandra Feswick, Chef de Cuisine at the Drake Hotel in Toronto; Nicole Gomes, Executive Chef at Nicole Gourmet in Calgary; and Thompson Tran, Chef and Owner at The Wooden Boat, Port Moody, BC. The esteemed judging panel consisted of Afrim Pristine, proprietor at The Cheese Boutique in Toronto; Vanessa Simmons, Cheese Sommelier at Savvy Company; Georgs Kolesnikovs of cheeselover.ca and the Great Canadian Cheese Festival; and Rita DeMontis, Sun Media food editor. This year's Cook-Off was organized by Dairy Farmers of Canada to take Canada's beloved mac & cheese to a whole new level and showcase the outstanding quality, variety, taste, and versatility of Canadian cheese made from 100% Canadian milk. "On behalf of Dairy Farmers of Canada, I would like to extend congratulations to all of this year's competitors for their creativity and competitive spirit—and showing us their amazing skills. Of course, there can only be one winner and we would like to thank Chef Feswick for her outstanding recipe and showmanship today," said Sandra Da Silva, assistant director, external communications at Dairy Farmers of Canada. "Everyone who was present at the competition is going to crave mac & cheese again very soon. I know I will." Cheese lovers across Canada can access these mac & cheese recipes and find tips for making the perfect mac & cheese by visiting allyouneedischeese.ca/cookoff. Cheese is a staple food in the Canadian diet, with 98 per cent of Canadians eating cheese regularly. Canadians make world-class cheese that wins awards internationally. With over 1,050 kinds of cheese listed in the Canadian cheese directory, Canadian cheese makers offer an enviable variety of local and international styles. Founded in 1934, Dairy Farmers of Canada (DFC) is the national organization defending the interest of Canadian dairy farmers and striving to create favourable conditions for the Canadian dairy industry. Working within supply management, DFC promotes safe, high quality, sustainable, and nutritious Canadian dairy products made from 100% Canadian milk through various marketing, nutrition, policy, and lobbying initiatives. Driven by a strong sense of community and pride, DFC and Canadian dairy farmers actively support a number of local and national initiatives. Visit dairyfarmers.ca for more information.